Basically, after the exhibition started, my mum and my artistic creativity started to slow. 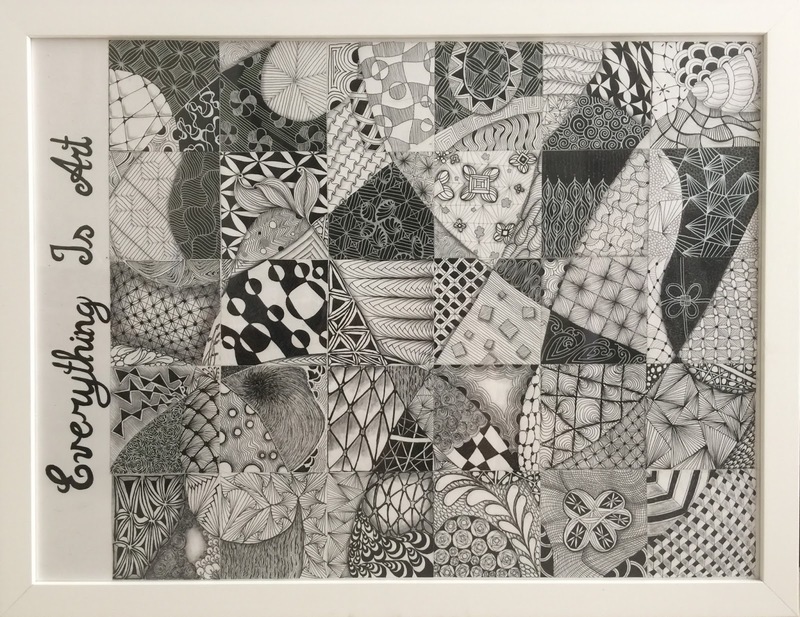 So to combat that, we thought of a project to do- a 30 days Zentangle project. The idea was to do at least one Zentangle tile a day. We got one large sheet of paper. Drew out 30 Zentangle tile-sized squares onto it. Drew many many strings onto it. Made sure to number each tile and indicate which way was the right way up. And then cut the paper into the individual tile sizes. We finished the project before the 30 days period, because on some days, we did more than one tile. After finishing all the tiles, we placed the tiles into their correct places, then glued them onto a larger paper. My mum also did a calligraphy of "Everything Is Art" on the left side of the paper. Here's what the final piece looks like. I didn't adjust the size of the picture this time. So if you want to see all the pretty details on each tile, just right-click the picture, and select "open image in a new tab". We thought the project was a great success and also created a coloured version of this challenge. You can see it via this link. Amazing and very creative. I love the idea.